In Windows 10 you will not see the Recent items at Start menu, also if you search it with keyword recent. there is no recent documents search result, only show about apps, show most used apps in Start and recently added apps. 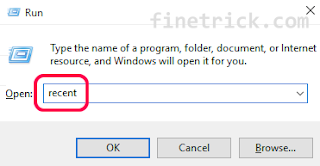 How to show recent documents or recent files in Windows 10? then the recent window will open. The recent shortcut will show at desktop. Click it to open.